We traveled to Mexico a few weeks ago, but we could have been in (insert any warm place with palm trees and ocean waves). We didn’t really do anything but drag our toes through the sand and watch boats glide across the ombré blue horizon. We sort of needed that, though. We needed to move forward after a long, draining winter – to get over lingering sniffles and sadness and let the sun’s healing rays soak into our pores. Mission (quickly) accomplished. By day 2, it was as if Mother Nature had pinched our ashen cheeks until we hollered for mercy. Still, we didn’t have the energy leave the beach, to drag all three kids through jungle tours or Mayan ruins, just so we could say we did it. With our luck, one kid would have ruined the ruins, and another would have wooed and pocketed a poisonous tree frog. Feeling so lame and yet still so tired, I vowed that, at the very least, we’d eat authentic Mexican food. We walked down to the mercado every morning for ripe papaya, it’s soft burnt orange flesh equally starchy and sweet. Then, for the rest of the day, I made everyone eat green foods: guacamole, quesadillas stuffed with roasted green poblano peppers, and the best salsa verde I’ve ever had. I ordered salsa verde wherever they served it, found my favorite spot, and returned there again. And again. And again. Until I worked up the courage to ask our waiter, in my pathetic broken Spanglish, what was in it. 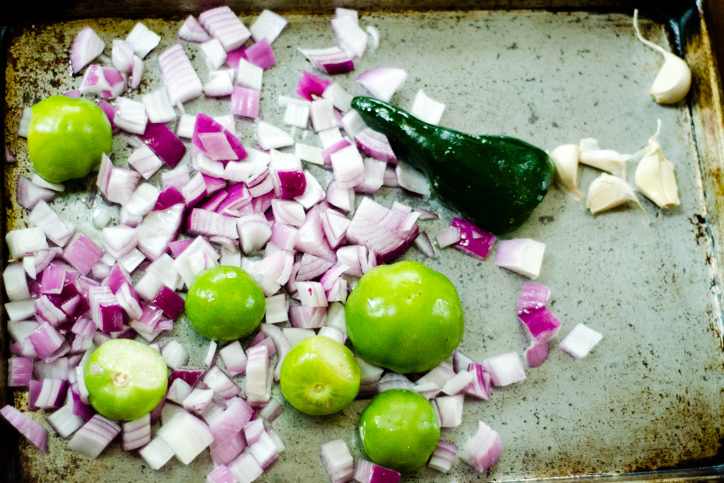 After a lot of wild hand waving and a few Oui!’s (by accident) and some ¡Si!’s and vigorous head nodding, I finally figured it out: LOTS of tomatillos, avocado, onion, garlic, poblanos, c-ee-lantro (I love that word), salt and lime juice. Phew. When we got home, it was Cinco de Mayo all week long. 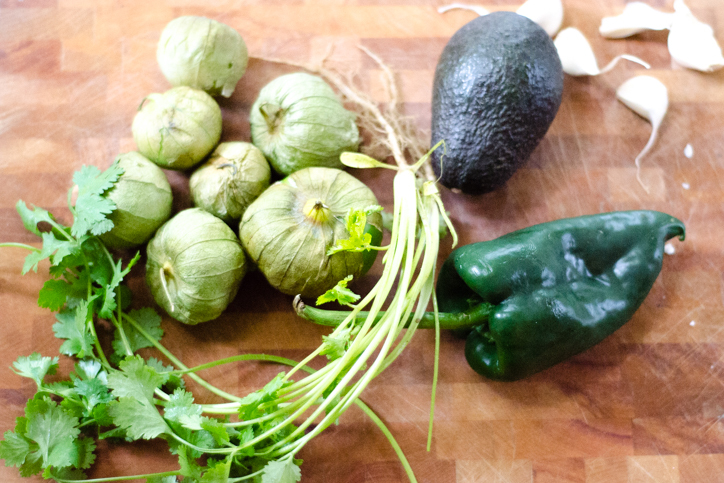 I bought pounds of tomatillos and tried to work out how to put everything together. At first, I whirred the raw ingredients in the blender. The salsa was too acidic and watery, the garlic too RAW, the flavor too thin. I clicked around the internet and found an old Gourmet recipe authored by Rick Bayless that looked promising. 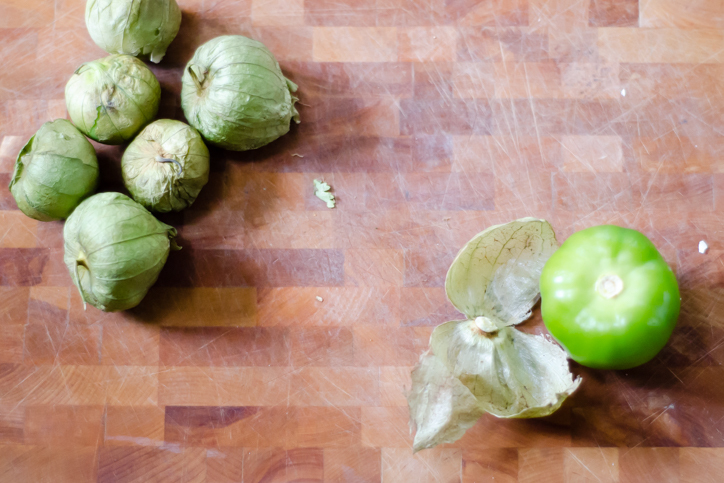 It turns out, he broils his tomatillos before blending. When Rick Bayless talks Mexican food, you just nod and follow his lead. Broiling is a sure-fire way to set off the fire alarms in our hood vent-free zone, so I adapted his technique, cranked the oven up to 450 degrees instead, tossed all of the ingredients with olive oil and salt, piled them onto a sheet tray and roasted them for about fifteen minutes. After letting the veggies cool for a minute or two, I squeezed the garlic out of the peel and scraped everything in to a blender, added some avocado and cilantro, and blended until smooth. Voila! …er… ¡Ahí Está! 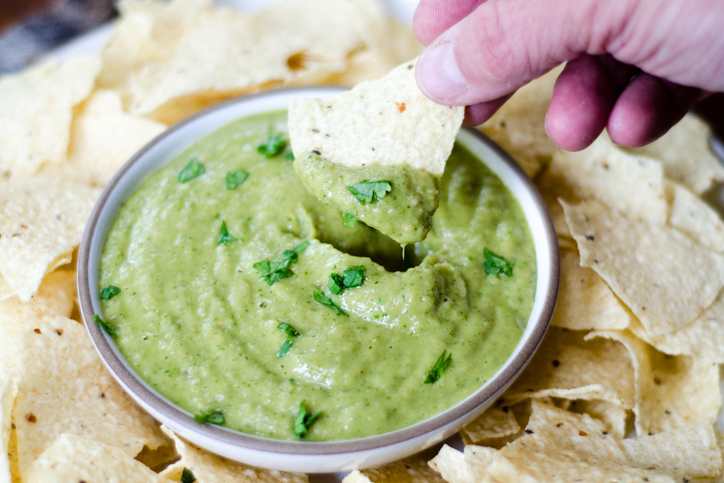 my gift to you from Mexico – tangy, creamy, spicy smooth salsa verde. Aren’t you glad it’s not an angry tree frog? 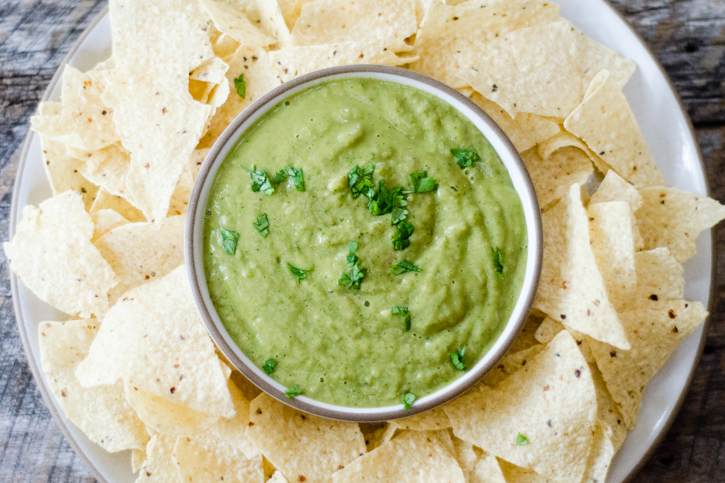 This salsa is quick and easy to make, requiring only a toss with olive oil, a quick roast in the oven, and a whir in the blender. This version is mild, but feel free to add hotter peppers (serrano, for example), or several dashes of your favorite hot sauce to spice it up a bit. 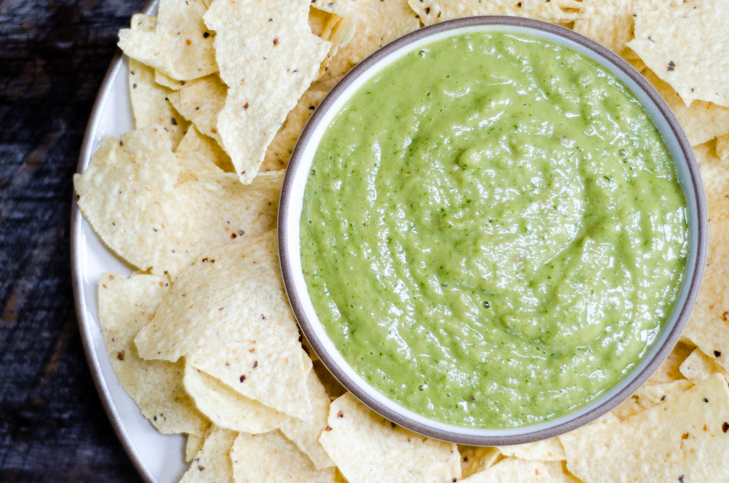 This is our new favorite condiment. 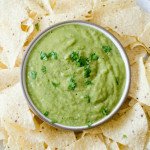 It's delicious with chips, on fajitas or burritos, sprinkled on bread with smashed avocado and a little sea salt, or even as a marinade (for a few hours) for grilled chicken or pork. 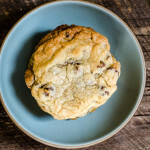 One batch yields about 2 cups. 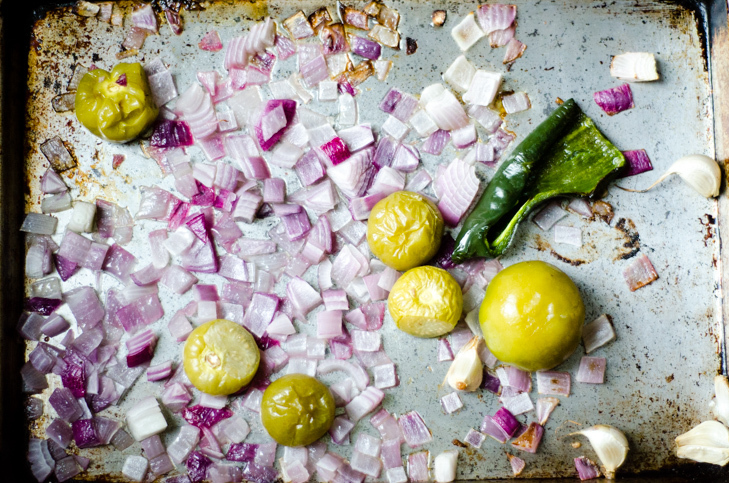 In a medium bowl, combine the tomatillos, onion, garlic, and poblano and roast 15 minutes, rotating the pan once in the middle of roasting. Remove the pan from the oven and allow the ingredients to cool slightly. When the garlic is cool enough to handle, slice a hole in one end and squeeze the garlic out of the peel. 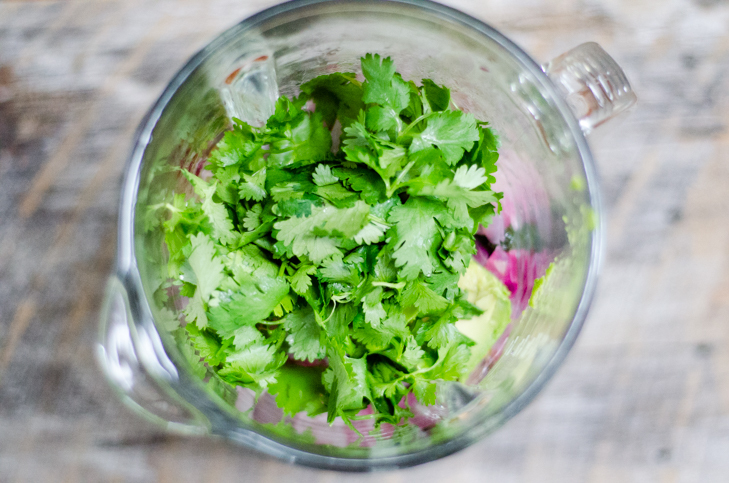 Dump all of the ingredients into the bowl of a blender. 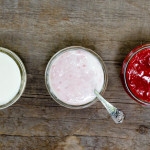 Blend on high speed until smooth, about 20 seconds. Add additional salt and lime juice to taste. Add a few dashes of your favorite hot sauce to make it spicier and blend to combine. Have some left after your taco fiesta? 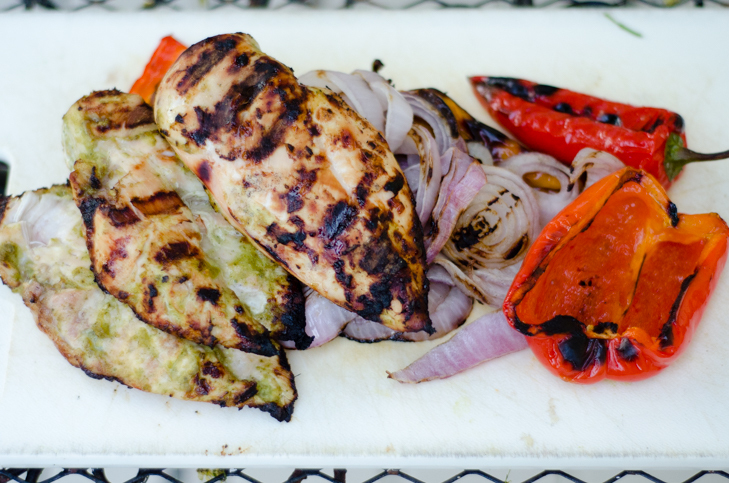 Try using the salsa as a marinade for grilled chicken or pork, or toss with grilled or roasted onions, peppers and tomatoes for a tangy side dish. The salsa was indeed supreme, and it went so well on everything from tacos to chips to chicken. I can’t wait to try your go at it.